Official Blogger Blog: Going somewhere interesting? Share it with the world! Going somewhere interesting? Share it with the world! If you ask people why they blog, a lot of the answers you receive will probably center around the idea of starting conversations. I love talking with friends and family about the countries I've visited and the cities I've explored, and personal blogs are a great way to share these stories. However, I have never met someone who felt they had enough time to post all of the updates that they wanted, especially when they are off traveling. Well, wouldn't it be great if anytime you were traveling somewhere new, taking off on a road trip, or just on your way to an exciting place, there was a way for you to automatically publish that information to your blog? We thought so too, and that's why we decided to release the Google public location badge, powered by Google Latitude. Google Latitude is a feature of Google Maps for mobile that lets you easily share your current location with a select group of your friends and family and, with your permission, it will continuously update in the background. Latitude is also available as an iGoogle gadget. While Latitude has been really popular, a lot of people -- many of them bloggers -- have asked for a way to share their location information on the Web, for all the world to see. 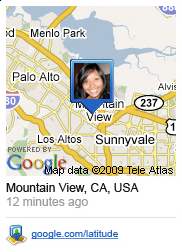 Now with the Google public location badge, you can share your Latitude location with everyone on your blog. Check out Danny Sullivan's blog to see how it looks. Please be aware that by enabling this badge your location will be available for everyone to see; you cannot decide who gets to see it. If you want to have more privacy, you can select 'city-level location' or choose to 'disable' the badge altogether. If you have any suggestions or run into a snag, let us know in our Help Forum.